Context: In Waterfowl park, not far from the main entrance, at the crossroads of the way leading to Clarence Street and an ancient passage in the marsh, orientated in the north / north east axle. 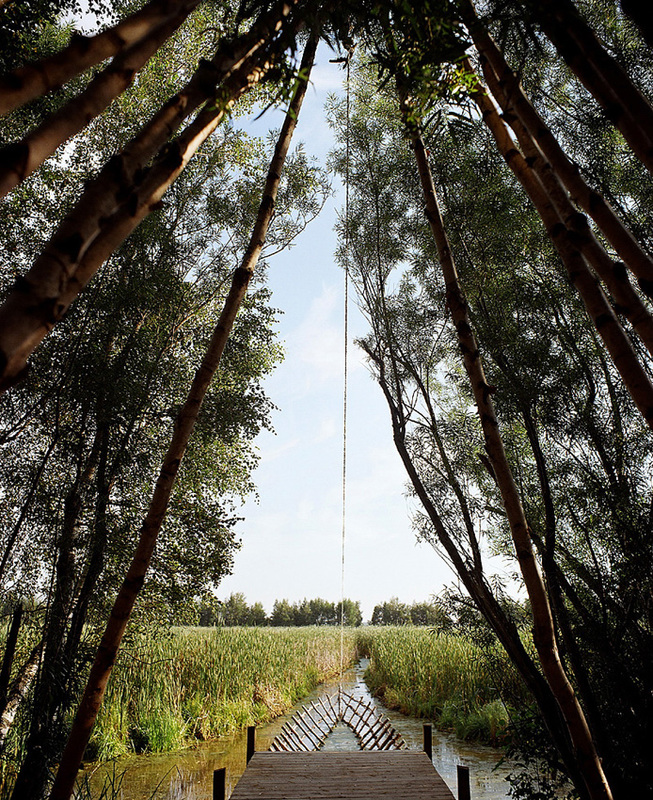 Materials: A willow of the basket-makers tilted in the axle of the opening in the marsh; about 60 young birches among which 24 young birches from 2 to 6 m of long for the shelter, others for the form of boat; bench; gravels on a thickness of 10 cm of the dock in the shelter; 4 beams of branches recovered about 10 m each; wood of work: pillars and boards, 23 m of braided rope; iron thread; twine of sisal; water and vegetables of the marsh; lemna minor (duckweed). Device: a shelter in birch; a dock; a form boat in birch; a raising in gravel of the space on the soil contained between the shelter and the dock; the accompaniment of the way on both sides of the installation on about 10 m and the widening of the pool of free water in the form of channel on about 35 m in the vegetation of the marsh. Dimensions of in situ: An isosceles triangle of a base about 22 m x about 65 m for each of other sides. Height maxi: 8 m..
Out of the omnipresent marsh, Sackville arose. When I discovered the once-busy port, the dykes, and the meandering former course of the Tantramar River, I was struck by the image of a landing and a boat. Tales of the taming of the tidal marsh and of the boat-builders who prospered on the riverbanks in days gone by stayed with me as I visited the park. There I found a place to work by a pathway bordered with basket willows, descendants of trees planted by Acadian colonists. An architectural model integrates these scattered fragments borrowed from the varied strata of occupation of these marshlands. To make the point, I accentuated an existing opening in the marsh. Broadening the channel created a frame of landscape within which to explore the details of my theme. A shelter suggests an up-ended canoe and a teepee such as might have housed the aboriginal occupants of the land. 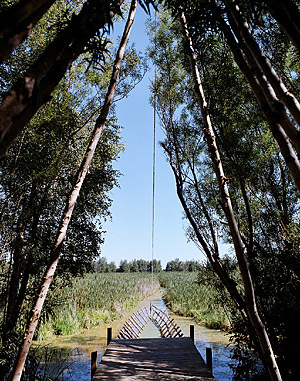 A leaning willow serves as mast or crane from which a rope darts outward to the prow of a symbolic boat/enclosure. The linking of shelter and vessel via the dyke/path and the dock transforms the whole into a sketch of a craft aligned with the axis of the channel. As the eye explores the elements of this transformation, the installation assumes the role of a habitat, on a personal scale, in which we may wander, sit, observe and meditate. It becomes, at last, an invitation to let ourselves be guided along the winding waterway until it loses itself in the marsh. To this end, the dynamic figure of the triangle lends rhythm and reinforces the allure: Let the mind embark... while waiting for the tide. For me, the image of the landing is not just a reflection of Sackville’s shipbuilding past. The abrupt change in the course of the river, which ended that era almost a century ago, reminds us of the fragility of our tenure on the earth in the face of natural hazards. It seems ironic, at the last, to think that the rise in sea level that we now anticipate as a result of climate change may well signal a return of the tides to these once and future salt marshes.